As winter sets in, all the berries on the bushes around the country park are disappearing fast. These cotoneaster berries pictured above, in the car park on Thursday 27th, are virtually the last type of bushes with any fruit on show. The blackbirds especially have been stocking up for the winter by stripping the berries off as have the occasional song thrush, mistle thrush and one or two wood pigeons. 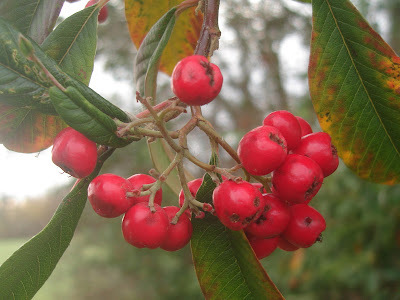 There don't appear to be any hawthorn berries left on the bushes and the hungry blackbirds have even started on the rose-hips too which seems early in the season for here. A brightly marked male sparrowhawk with peach-coloured cheeks and throat, swooped briefly onto my back garden fence to check the area out for small birds. Earlier a female sparrowhawk was seen at the back of the park pond, being mobbed by a jay. On the pond were 4 tufted ducks and a heron amongst the other regular resident wildfowl. On the grazing fields 200 wigeon fed in one corner while in other parts of the fields 12 black-tailed godwits, 50 goldfinches and 7 stock doves were noted. At the Point 9 snow buntings appeared from somewhere, flying over the beach, circled a couple of times and then flew eastwards across the river Colne to the beach at Point Clear. The incoming tide forced many waders into the last corner of mud with 25 avocets the most eye-catching. The biggest concentrations were 1000 dunlin and 100 knot with small numbers of grey plover and redshank. Just offshore from Ivy Dock in the river were 90 shelduck but little else in the Colne. A cloudy, dry night on Tuesday seemed suitable for some winter moth-trapping at the park but only one winter moth showed up all night. The tawny owl was seen flying along Bromans Lane in the car headlights on the same evening.